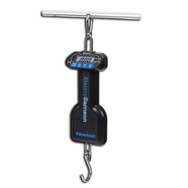 Solid performance is the foundation of Adam Equipment’s SHS hanging scales. 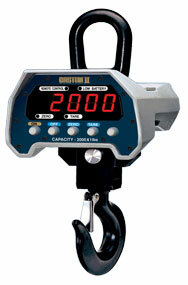 These flexible crane scales make it easy to measure suspended loads. Designed with safety in mind, each scale features a standard remote control that allows operation at a safe distance. The rotating hook with safety catch ensures stability and keeps the suspended item securely in place. High-contrast red LED display and indicators are easy to read in any lighting conditions. A handy hold function keeps the reading visible on the display after the weight is removed, allowing the operator to safely record the weight. Each model offers a built-in rechargeable battery, which allows the scale to be used in areas where power is not available. Adam Equipment has been a world-class scale and balance manufacturer for more than 40 years. Trust Adam to bring you quality products with a wide range of features to handle a variety of applications. 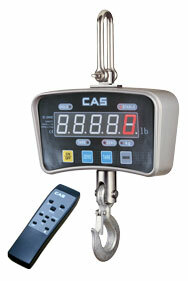 The CAS IE Series economy crane scale features a tough and sturdy die cast aluminum housing and a rechargeable battery with up to 50 hours of use between chargings. Both LED and LCD units have 1.1" displays for easy reading from a long distance and are Lb / kg unit switchable. 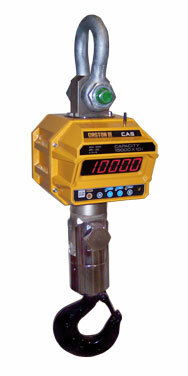 Each crane scale comes standard with a wireless remote control for safe operation and control. 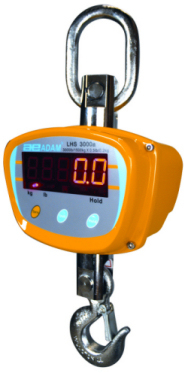 Solid performance is the foundation of Adam Equipment’s LHS hanging scales. 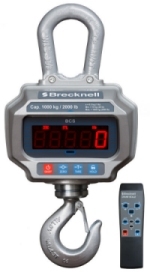 These flexible crane scales make it easy to measure suspended loads. 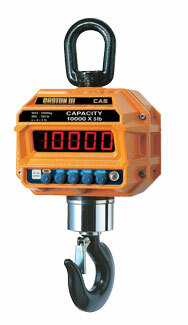 Designed with safety in mind, each scale features a standard remote control that allows operation at a safe distance. The rotating hook with safety catch ensures stability and keeps the suspended item securely in place. High-contrast red LED display and indicators are easy to read in any lighting conditions. A handy hold function keeps the reading visible on the display after the weight is removed, allowing the operator to safely record the weight. Each model offers a built-in rechargeable battery, which allows the scale to be used in areas where power is not available. Adam Equipment has been a world-class scale and balance manufacturer for more than 40 years. Trust Adam to bring you quality products with a wide range of features to handle a variety of applications. 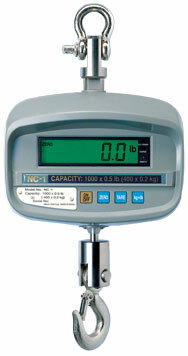 The new HA D series of crane scales from Citizen provide excellent performance in a light compact design. A high quality load cell is housed is a tough plastic ABS housing that is perfect for light industrial use or shipping departments. Choose from 3 different capacities and readabilities ups to 1,200 lbs. These crane scales are a quality alternative to higher end scales, yet come at a very economic price. The IHS crane scales offer durable easy-to-use weighing with smart features that take the hassle out of suspension weighing. With a range of capacities to suite different needs the IHS crane scales works for many different applications. The limits stated are the ultimate overload limits of the scales. Adam Equipment Co Ltd, its directors, staff, owners and affiliated companies and organisations cannot be held liable for any resulting damage or injury sustained as a result of the machines being used in excess of their capacities and ultimate overload limits. The CAS Caston III series crane scales offer industrial strength construction and durability in a compact and portable housing. The 1.2" LED displays are bright and readable from far distances. The scales also feature an easy to replace battery compartment for quick battery changes. All units come with wireless remote controls that allow full operational control from a safe distance. The CAS Caston III series crane scales offer industrial strength construction and washdown rate performance for all weather conditions. The 1.5" LED displays are bright and readable from far distances. The scales also feature an easily accessible battery compartment for quick battery changes. All units come with wireless remote controls that allow full operational control from a safe distance. The CAS Caston III series crane scales offer industrial strength construction and washdown rate performance for all weather conditions. The 1.5" LED displays are bright and readable from far distances. The scales also feature an easily accessible battery compartment for quick battery changes. All units come with a bluetooth wireless remote controls that allow full operational control from a safe distance.